The RFs were London Transport’s standard post-war single-deckers and met almost all London’s requirements in that regard throughout the 1950s, 1960s and well into the 1970s. 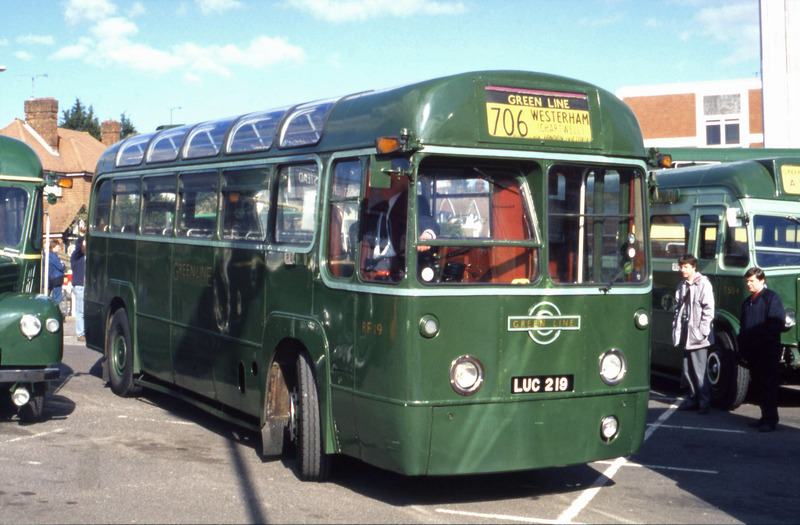 A total of 700 were built and there were versions for sightseeing/private hire, Green Line coach services as well as standard buses in red and green colours. Mechanically, the RFs were equipped with the same AEC 9.6 litre engine as their double-deck equivalent, the RTs, but in this case the engine was mounted under the floor, thus allowing the positioning of the passenger door ahead of the front axle and a considerable increase in seating capacity. London Transport had experimented before WW2 with different engine positions and had enjoyed moderate success with the 200+ side-engined Q-type buses and coaches built by AEC (see the Museum’s Q-type) and a smaller batch of Leyland’s underfloor-engined TF type. By 1949, AEC was developing an underfloor-engined version of its successful Regal chassis and the first prototype Regal IV was successfully tested in London service (registered UMP 227, the prototype is part of the Museum Collection), leading to the order for 700 production versions which were built between 1951 and 1953 as the RF class. The RF was a well engineered and solidly-built vehicle, so much so that its unladen weight was actually a little heavier than London’s contemporary double-deck RT type and the original cost of an RF at £4,149 was only £50 less than that of an RT. Bodywork was by Metro-Cammell who used their standard construction method of all-metal with a stressed inner skin and this, together with the modern appearance of the RFs, helped the class to lead a long and successful operating life. During the late 1960s, such was the satisfaction with the then 15-year old vehicles, London Transport carried out heavy modernisation of 175 Green Line examples to extend their working lives. The very last RFs were not withdrawn from London service until 1979.